This meditation (part two) is from a sermon I gave July 10, 2005 at Redeemer Lutheran Church in Henderson, Minnesota. It is the congregation my ancestors attended when they immigrated to Minnesota from Germany in 1875. 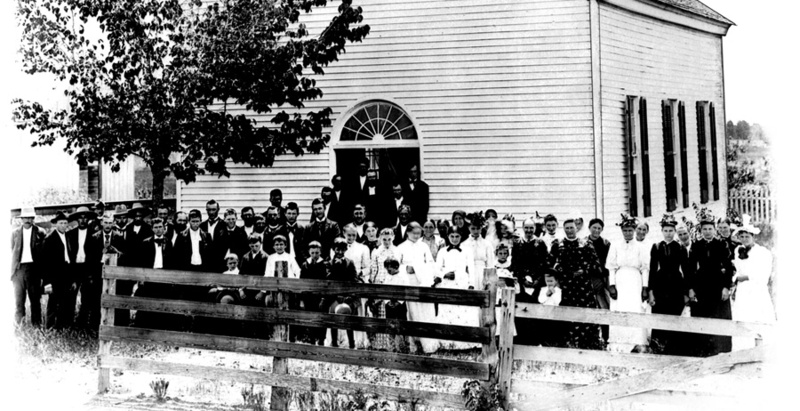 The congregation was already 20 years old in 1875, and in 2005 they celebrated their 150th anniversary. I was serving as Redeemer’s pastor at that time. (…continued) There have been many changes over the years, and there are many differences between us in 2005, and those very earliest settlers in 1855. Yet, all the people of every generation for all those years have had one thing in common. They first, and now us, have gathered here every Sunday to hear God’s Word; every Sunday for the last 7,800 weeks. And what do we hear from God’s Word? We first of all hear that there is a God in heaven. “Our Father who art in heaven,” we pray here every week. When we pray that, we are saying we believe that there is someone bigger than we are, bigger than this whole world; and, that there is another place, heaven, a place beyond everything we see and experience here on this little planet in this little universe. We then say that there is a time beyond all time here– “forever and ever,” we pray, as we conclude that Lord’s prayer. We come to church each week to get our eyes opened up a little wider, so that we can be reminded of eternity– and what a powerful thought that is! Everything else we do all week is connected only to the ‘here and now’– a ‘here and now’ that is swiftly getting away on us. We work so we can eat so we can keep these temporary bodies alive. We work with, visit with, fight with, and interact with people, other temporary beings, who come and go in and out of our lives, and, in and out of this world. We’ve all seen a lot of folks come and go already, haven’t we? Everything we do and everything we see all week, is temporary. Even this world, says the Bible and the scientists, even this whole world, is a temporary home, and will one day freeze over when our temporary sun burns out. Nothing will last– except, this Word and promise of God. Isaiah said a long time ago, ‘”The grass withers and the flower fades, but the Word of our God lasts forever.” James said, “What is your life? You are a mist that appears for a little while and then vanishes.” He is right. Where are all those people who started this congregation 150 years ago? They are gone, vanished, without even a stone to mark where their dust lies. That’s what happens to us. We vanish like a mist. We perish. But those old deacons, now perished, in 1855 would read to the people the same words from John 3:16 that we read now: “For God so loved the world, that he gave his only begotten Son, so what whosever believeth in him shall not perish, but have eternal life.” NOT PERISH, but have ETERNAL LIFE! You don’t get that kind of promise anywhere else. But according to John 3:16, you do get that from Jesus, whose name has been proclaimed on this spot for a century and a half. Jesus lived a life like us in the here and now of this temporary world, but came to show us the way to that eternal home. By believing in him, we receive that eternal life. And that brings me back to where I started, thinking about all those people that worshiped before us over the last 150 years. Because of that promise, they are not just dead and gone, but we are all, they and us, still a part of the same LIVING community. In Jesus, we still have this living connection. Therefore, on this anniversary celebration reunion, we need not look only back, we can also look forward to the time when there will be that far greater reunion. Those first pioneers that we never knew, and those who have just recently died that we knew very well and loved dearly, all will be a part of that great get-together. That is why I picked “When the Saints Go Marching In” as the hymn to follow the sermon. ‘I want to be in that number,’ we will sing, meaning I want to be there when our Lord Jesus brings us all home. I do want to be there and I want you to be there, too. So do what the Good Book says, “Believe in the Lord Jesus, and you will be saved.” And you will be there. Hebrews 11:39-40 — These were all commended for their faith, yet none of them received what had been promised, since God had planned something better for us so that only together with us would they be made perfect. Hebrews 12:1-2a — Therefore, since we are surrounded by such a great cloud of witnesses, let us throw off everything that hinders and the sin that so easily entangles. And let us run with perseverance the race marked out for us, fixing our eyes on Jesus, the pioneer and perfecter of faith. I Chronicles 29:15 — We are only foreigners living here on earth for a while, just as our ancestors were. And we will soon be gone, like a shadow that suddenly disappears. James 4:14b — What is your life? You are a mist that appears for a little while and then vanishes. Lord, I ask you not to separate me when I am dead from those who were dear to me while I lived. Lord, I beg you that where I am, they too may be with me. As I have not been able to see much of them here, let me enjoy their company in heaven forever. I beseech you, God most high, to grant a speedy resurrection to these children whom I love so much. Amen. An old photo of another congregation. Everyone pictured here has perished.